Anders Hejlsberg opens the developer keynote at TechDays 2010 in Belgium with: 'Trends and future directions in programming languages', on March 31st 2010. In this keynote Anders discusses the paradigms and future directions in programming languages. "The .Net Framework has about 10,000 classes with about 100,000 methods..." Help me I'm drowning! I envy the Turbo Pascal programmer of old. Thank you. Will the c# 4.0 talk be posted also? I'd rather have 10,000 classes with about 100,000 methods than 10,000 flat files with 100,000 methods, all of which require P/Invoke. After listening to the entire talk, I finally understand dynamic languages, and I understand where I'd like to use them. The issue I have with PLINQ is that it's sometimeslabelled as, "concurrency for the masses" and it bothers me. Concurrency is still hard, no matter how you slice it. I'm just worried of juniors throwing .AsParallel() on their LINQ queries and having horrid side effects. But also, prototyping doesn't require a Ph.D. in threading. I'm sure when .NET first came out and garbage collection was introduced the same apprehension was felt regarding this carelessness, just an observation. Anders is amazing as always. I'm glad he's in charge of our future languages development. The way he mixes practicality with pragmatism and evolution almost feels like magic. I've featured it, as it deserves. 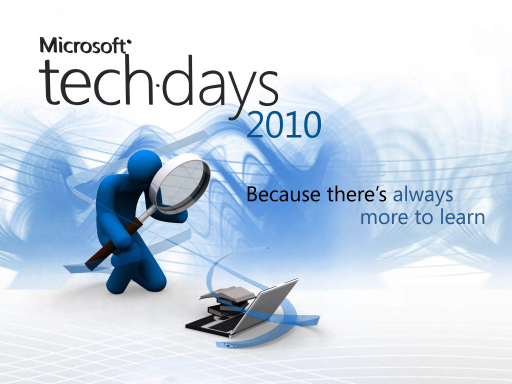 how about other sessions from TechDays 2010 ??? Nit: inline caching is a very old technique from Smalltalk and Self. immutable objects - specifcally ... isolation, purity (side effects) and immutability ... I love that Anders said "We should have better support in the language for immutability" ... clearly they're working on language features to make creating an immutable object dead easy! TechDays was pretty good this year. The sessions I enjoyed most were the Scott Hanselman sessions (very entertaining), the Anders Hejlsberg sessions, Bart Desmet's session about CLR 4 and Sara Ford's session about Visual Studio Tips. Is it just me... or should the declarative and dynamic circles be a whole lot smaller and more contained in the concurrent circle? It seems that the advances in the declarative and dynamic areas are mainly to enable the concurrent area. As presented, the trend is multi-core and everything needs to catchup to make that the baseline abstraction. Congradulations to Anders, that was a very concise, interesting and enjoyable overview. So, what is the future in programming languages? Doing the /qParallel - all problems solved? Sorry, but this keynote is for 5-year old programming toddlers? Nothing in there, that Anders did not say before in the videos Charles did over the years? But, I am not the audience for this. I did not want to sound too harsh. This sounds more like a Level 100 for marketing types who have to sell the new VS? Who is this audience? There are many moments when I was shaking my head, since the old discussions are popping up - this time unchallenged. Watching the power of dynamic and functional programming languages through his old 2D-OO-glasses is great for .NET, I guess. 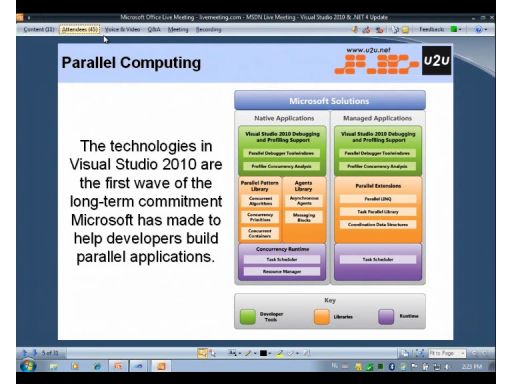 To the point about auto-parallelization: that's a misunderstanding or misrepresentation of the talk: no such thing was implied or stated - desirable as it may be. Anders just said there were many scenarios where a simple Parallel.For would be appropriate, something which is obviously true and one would be foolish to object to. I'd really like to see Anders' other session and also very much Bart's session. Before uploading, please do a good job of compressing the video. It is VC-1 compression after all and the WMV-High version should not suffer posterization, blocking and other highly noticeable artifacts, making it not much better than the regular WMV version. Can we download the slides from some place? The slide near the end with all of the languages on it would make an awesome evangelism sticker. 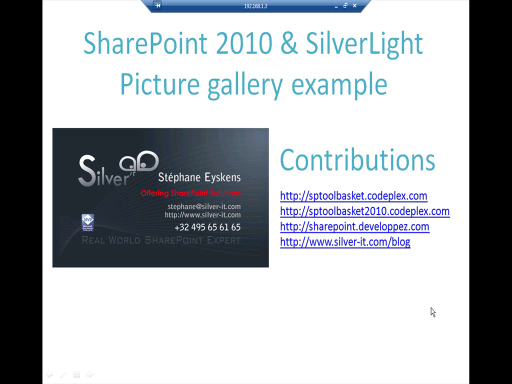 The slides are available here: https://www.microsoft.com/belux/techdays/2010/videos.aspx and then enter 'Anders Hejlsberg' in the speaker search box. 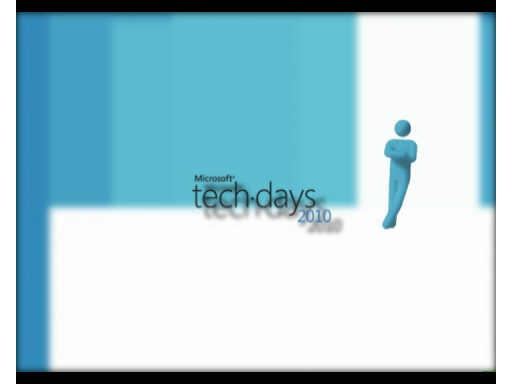 PPT's and videos of the other TechDays sessions are available too over there!